January 1st is regarded as 'Kalpataru Day' since it is an annual religious festival observed by monks of the Ramakrishna Math monastic order of Hinduism and lay followers of the associated Ramakrishna Mission, as well as the worldwide Vedanta Societies.The event commemorates the day on January 1, 1886, when Sri Ramakrishna revealed himself to be an Avatar, or God incarnate on earth in the Cossipur Uddyan Vati. 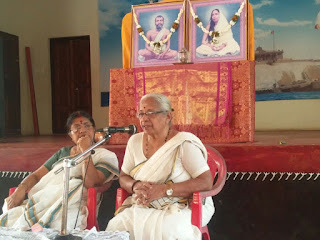 In the evening on the same day, 'Swantanam' the programme for senior citizens was conducted from 4.30 pm to 6 p.m. Dr. Geeta Swaraj, Ex-Principal of Maliankara college and a good orator and speaker was invited to talk to the group. When one reaches the stage of Vanaprastha, how one should spend one's life in the present times, was the topic of Dr. Geetha's talk. Using the examples from her own personal life and in a humorous way of her speaking ability, she kept the audience spellbound. In the end, she interacted with the vanaprasthis and gave some tips to lead a happy and joyful life.